Proper watering for poinsettias varies widely. Pot size, light, and temperature all have an effect on how much water a plant needs. Depending on their environment, some plants can use up 2-3 times the amount water other plants use. This is a problem because these plants are very particular about their watering needs and are quick to complain when things aren't right. 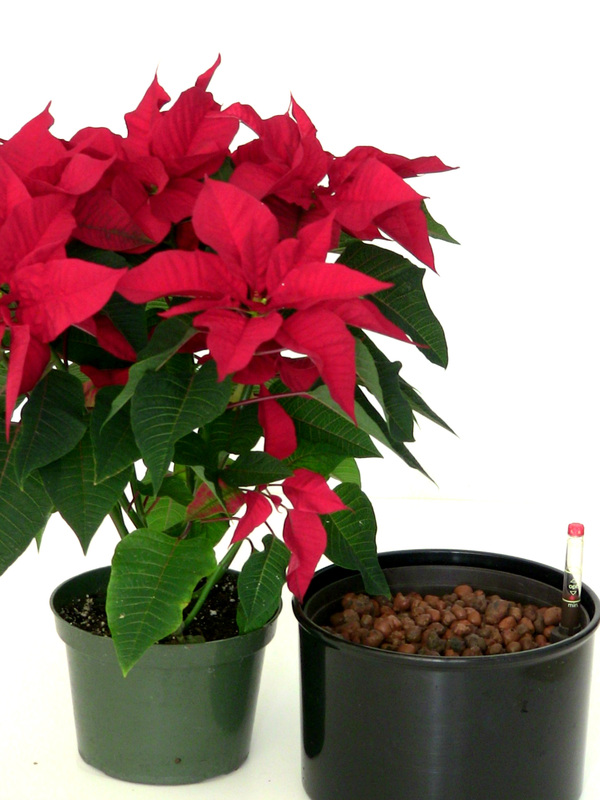 Hydroponics takes the guesswork out of watering but, unfortunately converting poinsettias to hydroponics just isn't practical. Our hydroponics system takes the guesswork out of watering but, unfortunately converting poinsettias to hydroponics just isn't practical. Transferring a plant to hydroponics means removing all the soil from the roots. 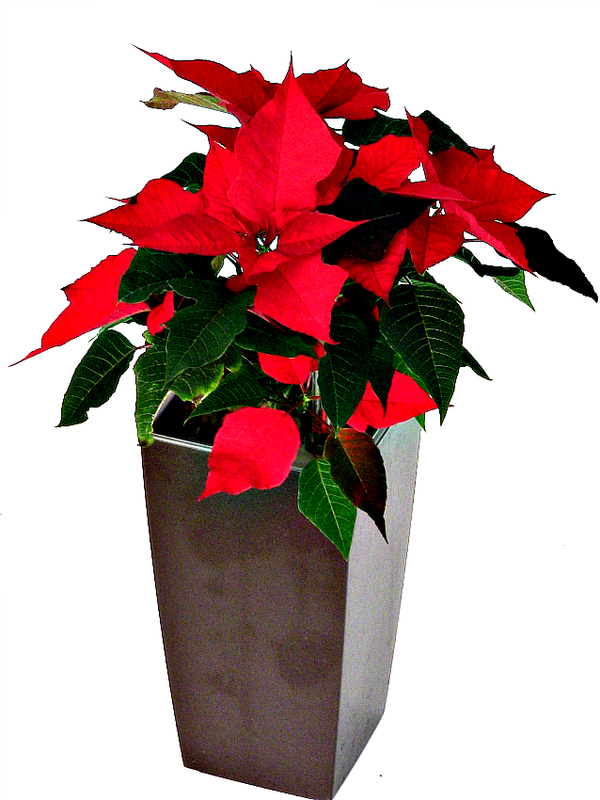 Poinsettias have a delicate root system and removing the soil damages the roots to the point where the plants have a difficult time recovering. There's another approach that solves the watering dilema - terraponics. 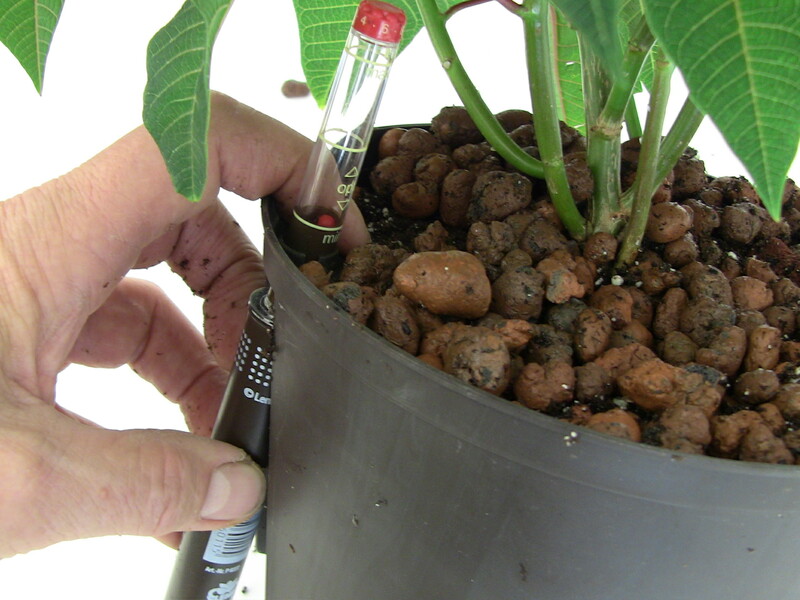 "Terraponic growing" takes the guesswork out of watering, the key ingredient to keeping your poinsettias lush and beautiful. Plants stay robust and color lasts longer. and transferring poinsettias to "terraponic" growing is easy. 1. Pot size is important. 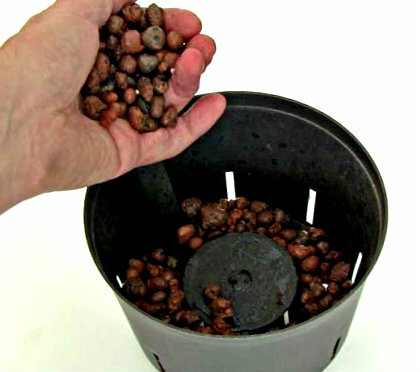 Select a hydroponic grow pot that's slightly larger than existing grow pot. 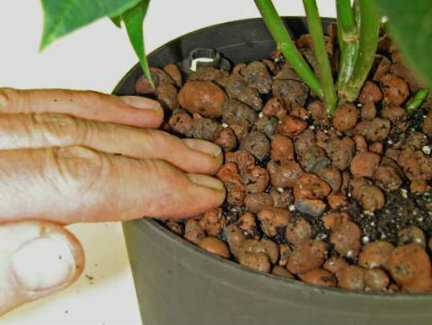 There should be at least 1/2" of space between the root ball and the grow pot on all sides. 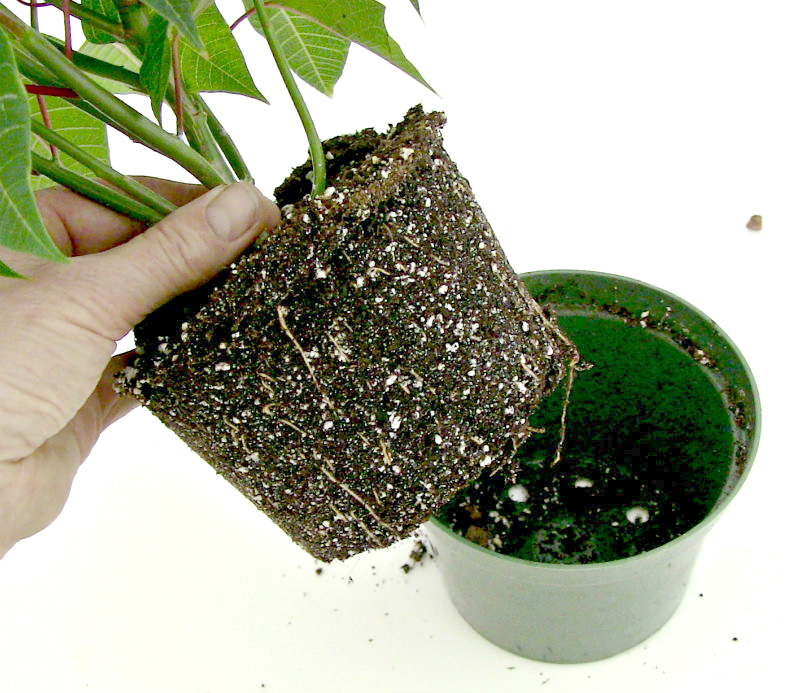 The new grow pot should also be at least 1" deeper than the existing grow pot. 2. Fill bottom of new culture pot with LECA pebbles. This space will act as the reservoir. Water gauge will show how much water is in reservoir. 3. Carefully remove plant from its grow pot. Notice how thin and delicate poinsettia roots are. 4. Position plant in culture pot. Root ball should be sitting on top of 1-2" of LECA pebbles. 5. Notice gap between root ball and culture pot. Fill this space with pebbles. The "capillary properties" of the LECA pebbles will wick moisture up to the root ball gently and evenly. 6. Pack LECA pebbles around root ball. Be aggressive. Don't worry, you won't damage the roots. 7. Insert water gauge to measure water level in reservoir. 8. New plant in decorative outer pot. Spanish moss has been added for a more finished look. Proper watering is the key to keeping your poinsettias robust. With traditional growing methods this can be tricky. 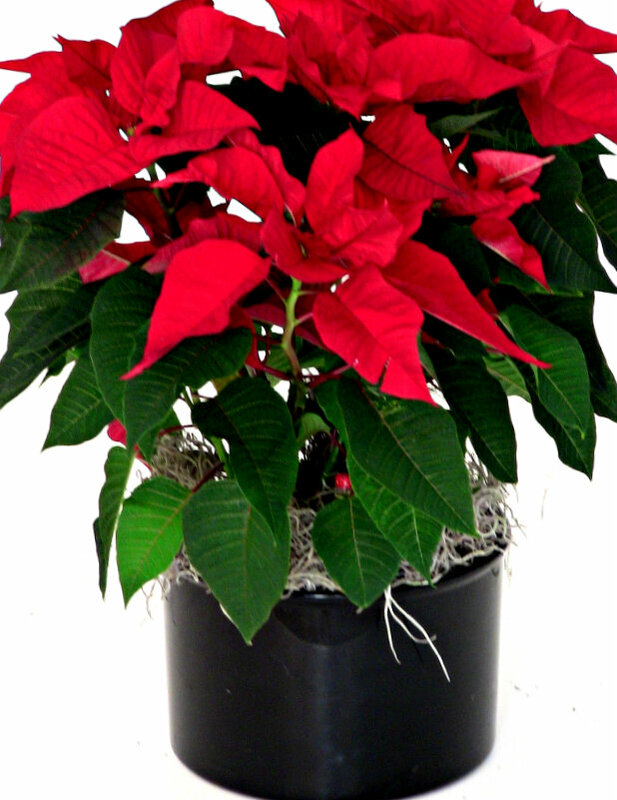 Poinsettias in hot, dry environments need more water than plants that are in cooler areas - sometimes 2-3 times as much. 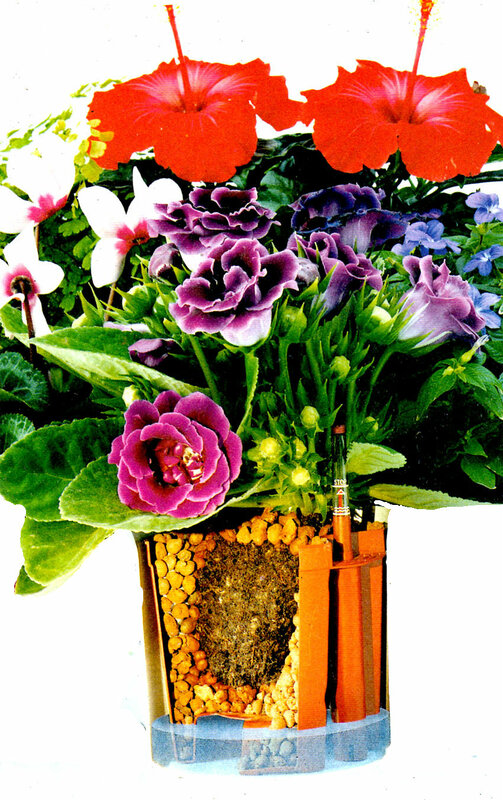 "Terraponic growing" takes the guesswork out of watering. 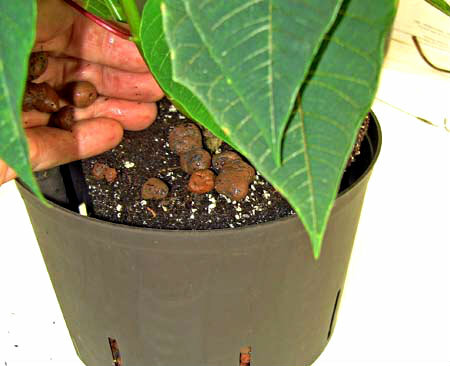 Your plant gets water gently and evenly from the wicking action of the LECA pebbles. Now you don't have to guess how much water your plants needs - the system will do it for you. All you have to do is refill the reservoir after the system dries out. This can take 2 weeks or more - good news if you travel! 1. Pour water over the pebbles until the water gauge reads "Opt". 2. Wait until the system is completely dry before rewatering. This will be several days after the water gauge reads empty. The key to watering with terraponic growing is having the patience to wait until the system is completely dry before rewatering. When the water gauge indicates the reservoir is empty, the soil in the root ball is still holding moisture. Waiting a couple more days (after the gauge reads empty) allows the root ball to dry out too. A good way to judge how long to wait is the weight of the plant. Lift the plant. If it feels light (like the pot is full of feathers) it's time to water. On the other hand, if the pot feels heavy (like it has a brick inside) better wait. Plants growing in terraponics are very forgiving when it comes to watering. We stress the waiting period because the tendency is to water more than needed. Instead of watering every couple of days, you'll be watering every couple of weeks! 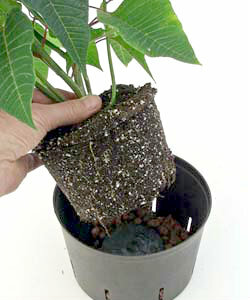 Remember, roots need air - too much water and they suffocate - no matter what system the're growing in.